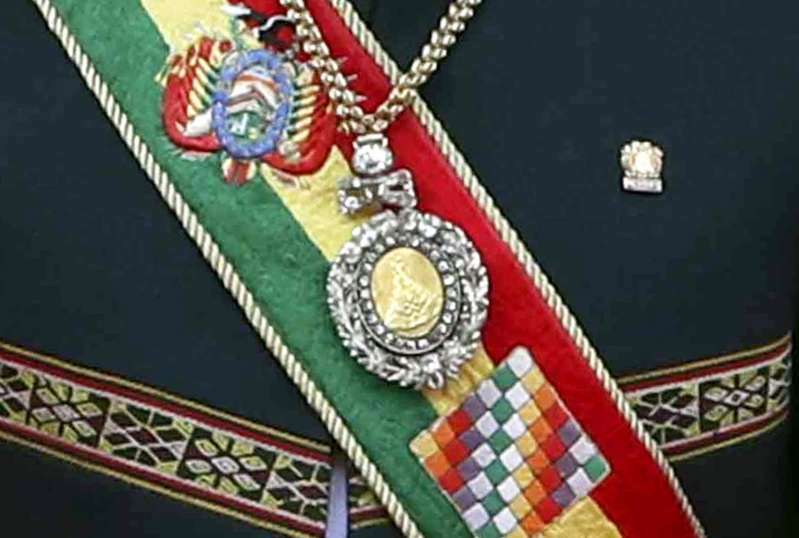 A diamond-encrusted gold medallion and an accompanying sash worn by Bolivian presidents was stolen after being left in a car in a red-light district, officials said. The nearly 200-year-old regalia had been left by a soldier inside a backpack, according to police. Security camera footage showed thieves breaking into the vehicle in El Alto, Bolivia, and grabbing the bag, police Col. Jhonny Aguilera told reporters. [post_ads]The culprits later called a television station to say they'd left the items abandoned outside a church in the capital, La Paz. The medallion and sash were later recovered. However, President Evo Morales was forced to appear at a military parade without the regalia on Wednesday. Carlos Mesa, a former president of the country, described the incident as "a scandal" and an "embarrassment." "We are talking about the most important national symbol," Mesa said in an interview with local media. "It is as if they robbed the crown of Queen Elizabeth of England." The regalia is worn by the country's president as a symbol of his office's power during some of the most solemn official ceremonies. Bolivia's first Congress gave the medallion to South American independence hero Simon Bolivar, after whom the country is named, in the early 19th century. The theft comes just days after Sweden's crown jewels were stolen in a Hollywood-style heist in broad daylight from a cathedral near Stockholm.